Tesla and The Boring Company are teaming up? Naturally. A few years ago, Tesla Inc (TSLA - Get Report) CEO Elon Musk tweeted about the dreadful gridlock traffic in Los Angeles. He's not wrong. Going just a few miles in LA can take an hour if one leaves at the wrong time. Don't even bother trying to drive in the city during Thanksgiving either, (trust me). In any regard, the eccentric billionaire said he was going to create a company to bore holes build speedy travel tunnels through the city. Well, it wasn't a joke and The Boring Company is here. It seemed like a playful idea when it started selling "Not-A-Flamethrower" products, but the business is real, and it looks like Tesla will be a supplier. 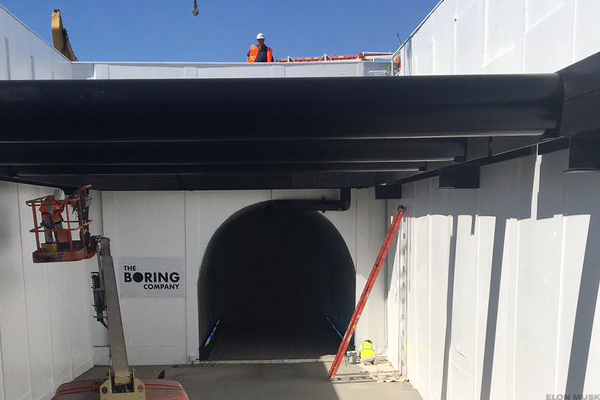 The Boring Company has created a tunnel in LA and is planning 10 miles of them for high-speed travel in Maryland. Next on the list? Chicago, which is looking for a high-speed connection from downtown to O'Hare Airport and has picked The Boring Company to build it. The new company has about $100 million in funding, mostly from Musk. He's also been buying Tesla stock, buying about 100,000 shares in the last five months. With the Chicago project getting the green light, it may not be too tricky for Boring to raise more capital. After all, Musk has found plenty of funding for SpaceX, another private company he runs valued at $25 billion earlier this year when it raised roughly $500 million. Notably, it has investors like Alphabet Inc (GOOGL - Get Report) (GOOG - Get Report) and Fidelity (FIS - Get Report) in on the mix. So what does all of this have to do with Tesla? Investors initially believed that The Boring Company would use Tesla's electric powertrain and possibly its autonomous driving software -- much simpler to do in a tunnel and on a rail than on the open road. But now though, Musk says that Tesla will make the entire pod, rather than just components for it. In fact, his exact words were: "The high-speed pods that will travel in the tunnels will be made by Tesla." It's not clear what that means for company revenue nor is a timetable for sales. Those are a few unknown questions at this point. However, Musk says the project in Chicago should take 18 to 24 months. While it could go over that estimate, he doesn't expect that it will take 36 months to complete. So sometime in the second half of 2020 is realistic based on that estimate. Expert Advice for a Risky Market. We asked top experts from Bank of America, Fisher Investments, Invesco and Wells Fargo what smart investors should do right now. Click here and register for free to watch what these market watchers recommend.